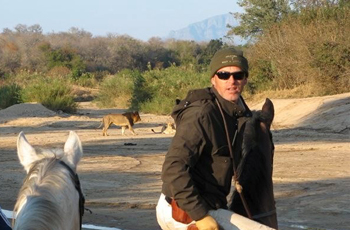 Philip and Gerti Kusseler started their horseback safaris in 1999. 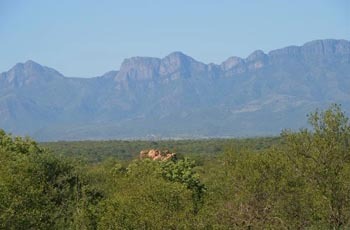 It operates in the Karongwe - Makalali Game Reserves and traverses a vast area of 25000 hectares. The area is Lowveld Bushveld with beautiful green drainage lines that thread through the area, with the spectacular backdrop is the Klein Drakensberg Mountains. 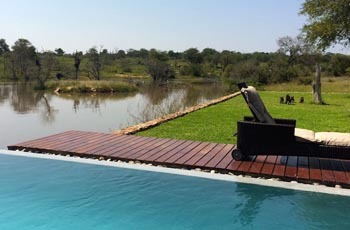 The reserve supports and host of wildlife, including the big 5 as well as wild dog and hippo. Forty horses make up the stables at Karongwe. The main breeds are the South African Boerperd, Warmbloods and Thoroughbreds. There is also a range of good solid bush horses, and every effort is made to match the rider with the right horse. 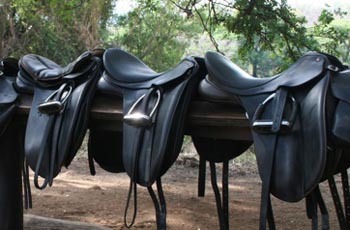 The tack used on the horseback safaris is carefully selected to ensure the horses comfort on long distance rides. All horses are undergoingtraining in basic dressage , which ensures that the horses are responsove and well behaved and fun to ride. The saddles used on trail are Leon Liversage Endurance saddles designed for long distance rides, allowing good comfort to the horse and rider alike. If English saddles are preferred by guests this can also be provided. 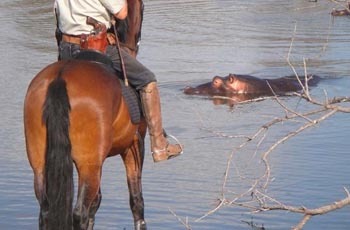 There are three different horseback safaris to choose from and these vary in length from 5, 7 & 9 night safaris. The safaris make use of different camps making for a varied and interesting African safari. Wait A little Tented Camp is a Luxury tented camp built on wooden platforms. Each tent offers complete privacy and have ensuite facilities bush style. The dining room offers a great reaxation area and the camp has a swimming pool that overlooks the river bed, that guests can enjoy in the heat of the day. The camp also has one rondavel (round house), also with ensuite facilities that guests can use. Beacon Rock is a sleep out camp that is perched on a rocky outcrop that forms the highpoint in the and commands a breathtaking view over the African bush and distant mountains. In this camp guests sleep on mattresses under the stars or under a shelter and enjoy a campfire at night to the sounds of the African wild. 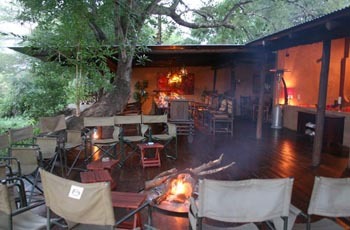 XiDulu is a private camp located in the Greater Makalali Game Reserve. The camp overlooks a dam with a resident raft of hippo. The camp is very comfortable and intimate with just five rooms. 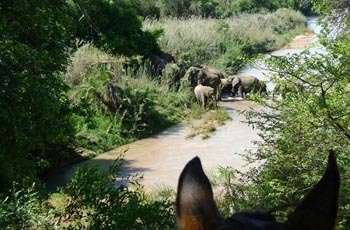 Big Five Camp Safari... This is a 6 day & 5 night camp safari. We spend 4 nights at the base camp, 1 night at a fly camp. This horseback safari starts Saturdays and requires a minimum of 4 guests. Big Five Safari ... This is 8 day & 7 night. We spend 4 nights in base camp, 1 night in a fly camp and 2 nights at Makalali Camp Phiva. This horseback safari runs throughout the year and starts & ends on Saturdays. Big 5 Ride & Dine Safari... This is 10 day & 9 night safaris uses lodges that have a dining area, lounges, swimming pools, sun decks, en suite bathrooms, outside showers, baths, king size beds, private decks, three meals from excellent cuisine, therapies, bush breakfasts, lunches and dinners, picnics, special diets, special wines. : Transfers to/from Wait a little, staff gratuities, massages, special wines, champagne and spirits. For more information on the detailed itineraries or if you want to make a reservation, just drop us a line, or complete our enquiry form.